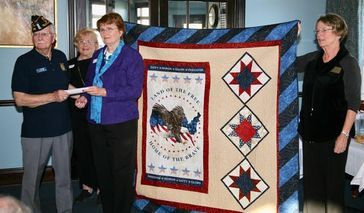 The Quilts of Valor Foundation began in 2003. After her son was deployed to Iraq, Catherine Roberts felt the need to help in some way. Being a quilter, she made a quilt for a wounded returning service member to offer comfort and healing. Now, more than fifteen years later, it is a national organization and to date at December 2018, over 208,490 quilts have been awarded to active duty military members and veterans from all American conflicts. The mission of the Foundation is to cover service members and veterans touched by war with comforting and healing Quilts of Valor. It's going to be an awesome task to do that when you consider that there are over 2 million active duty and reserve troops plus over 22 million veterans out there today. That is why, unfortunately, we cannot present QOVs to family members or children of service members or veterans – there are many other groups that work towards those missions. The association between The Village Quilters and Quilts of Valor began with a challenge – the usual VQ guild challenge which is issued once every other year. In June 2009 it was to create a patriotic Quilt of Valor which is a special, tangible way to say “Thank You for your Service”. After the competition, all the quilts were to be distributed to wounded or returning veterans. We had our best response ever and 85 quilts were made and distributed. From that time on, a large number of quilters were hooked and wanted to continue the cause. Our TVQOV group was formed that year and, since then, meets once a month to create the special “Thank You” quilts. 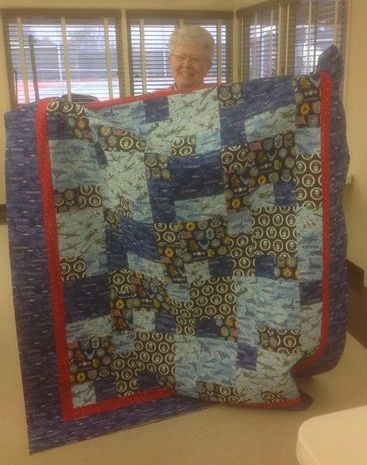 The QOV group is a registered group member of QOVF and to date at December 2018 (including the original 85), we have distributed over 720 Quilts of Valor for the east Tennessee area and beyond. The picture above is Judith Kubesh, guild member and US Veteran, with her QOV on Veteran's Day 2015. For information on basic requirements for making a QOV click here or download the QOV request form from the FORMS section here. In early March, 2017, Leslie Phillips, Rita Hollenbacher, and Linda Arbuckle had the honor or representing the guild at the Tellico Lake American Legion. The Legion Post presented a check to us for the Quilts of Valor. Our reps were touched to hear a few of their members tell the importance of quilts they have previously received. March 2, 2017; Tellico Lake American Legion Post #256 presented Village Quilters with a check for Quilts of Valor. Arliss Barber of The Village Quilters presented a Quilt of Valor to Don Ritchey who served as a Corporal in the US Army from October of 1950 till July of 1952 with a 21-month tour in Korea during the Korean War. Mr. Ritchey's family has a long and interesting local history -- one of the major roads in our Tellico Village Community bears their name. Corporal Ritchey served with the 3rd Infantry Division, 2nd Battalion, 15th Infantry Regiment, G Company. Many thanks for his valuable service to our Country!